From the Spaces screen, users can view all of the spaces associated with a Portfolio as well as their label, last updated date, and status. The spaces can be sorted either up or down by any of the headers by clicking on the headers or they can be filtered by status, label, or owner using the menu to the right of the list. Spaces can be saved as a template by using the menu button and selecting Save as template. Templates can be used to create new spaces with predefined settings and content to start your projects even faster. 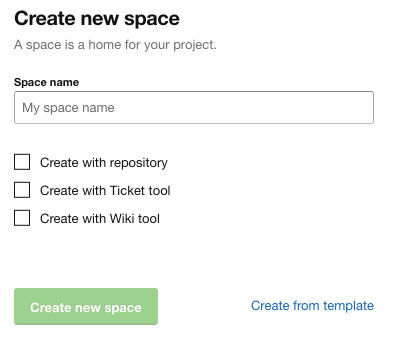 Spaces created from a Template will inherit the Template’s Assembla Tools, milestones, custom ticket fields, custom ticket status names, custom ticket reports, files, wiki pages, and Build tool settings. To create a new space from a template, select Add New Space. Then, select the Create from template link on the new screen. You'll be able to choose from a variety of default templates or from any custom templates that you have created.